Recently, I discussed my experience with the Whole30 program, a 30-day diet (or as I call it, a "lifestyle alteration") which I believe LeBron James used for 67 straight days to drop weight in what he called an offseason challenge. Whether or not he did it for "basketball reasons," you have to admit: Bron looks good. And hey, I look good too. Well, at least I think I do. Back in June, I did the Whole30 (also for non-basketball reasons), cutting grains, dairy, legumes and sugar -- among other things like soy and alcohol -- and I took a lot of great things from my time on the program that I believe make me a healthier person today. This isn't native advertising: I just want to make sure people know LeBron didn't embark on a diet that's impossible for regular people to follow. As far as I'm concerned, that dude copied me. a) It may lead to nutrient deficiency. b) It isn't sustainable long-term. LeBron was able subsist on just meats, vegetables, fruit and nuts/seeds for such a long time because he has, in all likelihood, people dedicated to making sure he eats well and right. It takes planning to do what he did for as long as he did. And you know what? You can plan too. You can make sure you get all your vitamins and minerals too. You can do this too. In an effort to push you the right direction, allow me to bust some myths about the Whole30 -- which, even if it isn't exactly what LeBron was on, is close enough in philosophy to be used as an example here and a basis for your own experimenting at home -- and explain why it's a safe, natural, and even fun way to get healthy. NOTE: This rundown isn't meant to be all-encompassing. The science behind much of this can be found on the Whole30 site (I'll provide some links) as well as in their book, "It Starts With Food," which I refer to often here. Think of this as a checklist of reasons you can tell yourself, and others, as to why you're doing this. It's a cheat sheet of sorts, okay? I'm not an expert, nobody is an expert. 1) First of all, we all know this isn't "sustainable long-term." To be 100 percent "Paleo" or otherwise on the Whole30 guidelines forever is impractical. The original program only calls for a 30-day experiment -- you can go longer, as LeBron did, but it's usually upped to Whole45, or Whole60, or Whole90. Not Whole365x100. The Whole30 people say this themselves. 2) The reason you take all these foods off the table is so you can put them back on. Pretty mind-blowing, huh? The point of removing grains, dairy and the other foods on the Whole30's no-list is that they are the most common causes of chronic, systemic inflammation. But since everyone is different, you won't be sure which of these foods is most damaging to you personally until you clear them from your body entirely. After 30 days, there's a reintroduction period as you slowly cycle each of these food groups back into your diet. After three days of seeing how your body reacts to a healthy diet + grains, or a healthy diet + dairy, or + legumes, you'll get a better idea of what foods make you tired, which make you gassy, which contribute to acne, etc. For me, dairy isn't really an issue, but I found that legumes like black beans and grains (particularly gluten grains) gave me heartburn, which was my original reason for going on the program. Success. 3) There's not a single vitamin or mineral in grains you can't also get from fruits and vegetables. "When you start excluding dairy and whole grains, those are all very nutrient-rich sources that provide important vitamins and minerals into the diet. And when you start restricting that, particularly for a length of time, you can run the risk of nutrient deficiency," [Joy Dubost, a registered dietitian and spokesperson for the Academy of Nutrition and Dietetics] said. I'm sure Joy Dubost is a smart person and more knowledgeable than I am on this subject, but frankly, I have no idea what she's talking about. Let's talk about grains first: They are NOT nutrient-dense when compared to fruits and veggies. Whole grains provide more than three times the sugar and sodium as a diet featuring veggies and fruit, while giving us less potassium, magnesium, iron, zinc, and vitamins A, B6, B12, C, D, E, and K.
What makes grains so much more nutrient-friendly than vegetables and/or fruit, then? I'm not sure. By the way, there's also science that supports the idea that eating grains doesn't mean you'll be able to use the nutrients stored inside. 4. The same goes for dairy -- we can find better sources of the vitamins it provides. Calcium is mostly what people talk about when they say not drinking milk is bad. WHAT WILL WE DO WITHOUT THE CALCIUM FROM MILK? As the Harvard School of Public Health notes, one or two servings of dairy per day should be the limit -- otherwise, get your calcium from things like, yes, vegetables ("Calcium-rich non-dairy foods include leafy green vegetables and broccoli, both of which are also great sources of vitamin K, another key nutrient for bone health"). Other ways to boost bone health include getting vitamin D (go outside, get some sun) and do some weight-bearing exercise. Meanwhile, we've been so obsessed about drinking milk for the calcium that we forgot: cow's milk (which is mostly what we drink in the U.S.) is meant for, you know, baby cows. It contains tons of hormones that are meant for growing calves. Why mess around with hormones when you can get the calcium you need from other sources? 5. Yeah, even legumes and soy do more harm than good. The most common response I got when I told people about the foods I was cutting out of my diet for a month was "Legumes too? What's so bad about legumes?" It's more that legumes are not as micronutrient-dense as we first thought, and some of the short-chain carbs (i.e. sugars) found in legumes aren't properly absorbed in the small intestine, which, long story short, leads to unpleasant symptoms like gas and bloating (ya know, like, how beans make you fart?). Meanwhile, soy is rich in hormonally-active substances, so our body recognizes the compounds in soy as estrogen. Seriously. 6. Cutting out sugar and sweeteners (and alcohol) makes you realize how addicted you are to them. Many foods on the Whole30 no-list can be referred to this way, but sugar and sweeteners are especially "supernormally stimulating." We don't have foods that taste that sweet in nature, so we crave them. The sweet taste of table sugar, Equal, Splenda, and so on promote overconsumption and have no nutritional value. That's how you end up eating a whole sleeve of Oreos, or more. The same goes for alcohol. It is wildly addictive, as we all know, and not only does it provide a ton of empty calories with no nutritional value, but it's a toxic substance that triggers an unhealthy psychological response that leads to bad decisions (like eating a whole pizza, or hooking up with your ex). 7. You end up eating a lot of delicious things, and not having to worry about limiting yourself. You eat tons of things that most "diets" would tell you to minimize or lay off altogether. I can remember my mom going on diets that involved writing down every little thing she ate and taking a caloric count of it. That's insane to me -- I just want to feel satisfied. And while it's hard to imagine finishing a meal without ice cream and feeling good about it, trust me: You'll start to get similar satisfaction from blueberries and nuts after a dinner of sirloin steak, sweet potato and asparagus. Just as an example. 8. You're perfectly capable of planning out your meals and making sure they're Whole30-friendly. "LeBron James will walk into a restaurant and they're going to do whatever they can to accomodate [sic] him. He's going to have personal chefs and personal nutritionists," Dubost said. "Your everyday person will not get that." Okay, well, I get that LeBron can probably order sushi at a pizza joint and get the rolls he wanted in about 10 minutes, but just because he's a star doesn't mean he's the only one who can ask for certain accommodations at restaurants. The most I ever needed to say was "Does that have cheese? Can it... not have cheese?" or maybe "Does that have croutons? Can it... not have croutons?" or even "What kind of dressing does that come with? Can I... have that on the side?" Here's another way I made sure I was eating everything I needed to stay healthy: I looked at charts. I looked at numbers. I looked at lists of vegetables that were nutrient-dense, like kale, or broccoli, or squash. Then I went out and bought those things and cooked them and ate them. Simple. 9. Reading labels at the grocery store helps you understand how much we put into our body that we don't need. I found early on in my Whole30 that, if left to my own devices, I wouldn't be able to discern which things had sugar or legumes or other bad things in them. I started reading labels and realized that most things at the supermarket have some kind of gross preservative or otherwise non-healthy additive. Here's a brief list of things I couldn't eat because they contain sugar: ketchup, pasta sauce, peanut butter, most salad dressings, most fruit juices, bacon. Yes, this made surviving my 30 days more difficult, but it helped me appreciate that my diet hadn't been under my control for years -- I was feeding myself things I didn't even know were bad (though that applies to this entire experiment, really). 10. The sense of empowerment and self-control is immeasurable. Here's a feeling you can share with LeBron: It's difficult to cut all these addictive and commonly eaten foods out of your diet. It does get easier to turn down cake at a birthday, or a beer at a bar, or a PB&J from mom, but it's never easy. He probably felt a lot of pride in his accomplishment, and you will too. But here's something he likely didn't have to contend with, and thus something that you can take even MORE pride in: fending for yourself. When you go from constantly taking the easy way out of getting full (just make it into a sandwich! ; just eat a bunch of french fries! ; just eat the whole pint of ice cream!) to having to get creative, you'll understand the "fun" aspect of the Whole30. I went from being downright stupid in the kitchen to making some things that I wouldn't mind sharing with other people; I used to just make things that were "good enough" rather than "good." Becoming a proficient cook is a skill that lasts a lifetime; ditto being a smart shopper. And knowing what foods make you sick or otherwise inflamed is information you'll wish you had years ago. You might not make millions of dollars like LeBron, but how good is his chicken stir-fry? That's what I thought. Reminder: I'm not a dietitian. I don't know what works for everyone. But I know what worked for me, and we all see what worked for LeBron. The only way to know if it works for you is to try it yourself. 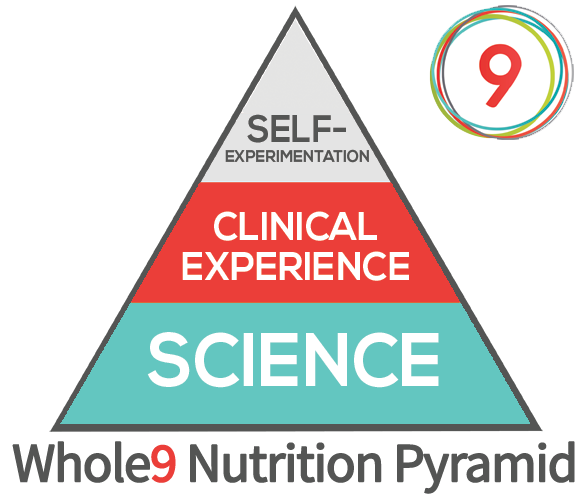 At the top of the Whole30's nutrition pyramid is self-experimentation, so as much as you can read articles or books or tweets telling you about one study or another, at some point, you've got to take the plunge and see for yourself. Just don't let anyone tell you can't because it's too extreme, or you're not rich, or you don't have what it takes. That's just fear talking, and maybe a little bit of self-consciousness -- if they "can't" do it (and they can), they don't want you to either. By the way: The Whole30 is easier with friends and supporters. Get some of those on board, too.